The immune system is an important system for protection body from infections and destroying cancer cells. The immune system consists of a sophisticated array of cells that have developed to recognize and eradicate a wide variety of microorganisms and cancers. T lymphocytes are important players in this process. They can be stimulated by peptide antigen presented on major histocompatibility complex (MHC) molecules expressed on antigen-presenting cells (APCs). Upon T cell stimulation, they secrete IL-2 and express surface IL-2 receptors. Binding of IL-2 to its receptors, through the autocrine mechanism, induces clonal expansion of T lymphocytes. The activated T lymphocytes are then subsequently differentiated to the effector cells for generating immune functions. T helper cells (also known as Th cells or CD4+ lymphocytes) are a subpopulation of T lymphocytes that play an important role in establishing and maximizing the capabilities of the immune system. These cells have no cytotoxic or phagocytic activity. They cannot kill infected host cells or pathogens. T helper cells, however, are involved in activating and directing other immune cells to function. They are essential for the induction of antibody production by B lymphocytes and determining B cell antibody class switching. The T helper cells also involved in the activation and growth of cytotoxic T cells (also known as Tc cells or CD8+ lymphocytes) for the killing of virus-infected and cancer cells. In addition, T helper cells can activate and maximize the bactericidal activity of phagocytes such as macrophages, monocytes, and granulocytes. It is this diversity in function and their role in influencing other cells that give T helper cells their name. T helper (Th) cells express the CD4 molecule and, after activation, can differentiate into at least two subsets, Th1 and Th2 cells (Fig. 1). The Th1 and Th2 cells have different function and produce different cytokines. Th1 cells are important for the eradication of intracellular pathogens, including bacteria, parasites, yeasts, and viruses. The hallmark cytokines of Th1 cells is IFN- which can activate microbicidal activity as well as cytokine production in macrophages. These cytokines also involved in the activation of CD8+ lymphocytes and NK cells which play a major role in destroying cancer cells. TNF- , a potent pro-inflammatory cytokine, was also demonstrated to be produced by the Th1 cells. The primary role of TNF- is participating in the regulation of immune cells. TNF is able to induce inflammation, to induce apoptotic cell death, and to inhibit tumorigenesis and viral replication. Dysregulation of TNF production has been implicated in a variety of human diseases, as well as cancer. Other cytokines, such as IL-2, tumor necrosis factor- (TNF- or lymphotoxin) and IL-10 have also demonstrated to be Th1 cytokines, but none defines this lineage as clearly. It is noted that IL-2 is classically associated with Th1 cells, but this association may be misleading; IL-2 is produced by all helper T cells early in their activation. A Th1 response is often accompanied by the production of complement-fixing antibodies of the IgG2a isotype, as well as the activation of natural killer (NK) cells and cytotoxic CD8+ T cells expressing IFN- and perforin. Taken together, the activation and induction of Th1 cells are of importance for the generation of a powerful cell-mediated immunity. In contrast to the Th1 cells, Th2 cells produce a different type of cytokines. After activation, Th2 cells secrete cytokines IL-4, IL-5, and IL-13 and can activate mast cells and eosinophils. Depending on their secreted cytokines, the Th2 cells function mainly to mediate humoral immunity, eradicate helminths and other extracellular parasites. These cells also mediate allergic and atopic manifestations, which is in keeping with findings that Th2-derived cytokines can induce airway hyperreactivity as well as the production of IgE. Both Th1- and Th2-specific cytokines can promote growth or differentiation of their own respective T-cell subset but additionally might inhibit the development of the opposing subset. During the last decades, development of specific agents affecting T helper cell subpopulations, i.e., Th1, Th2 and Th17, differentiation has drawn special attention. Many natural products were reported as a good agent for modulating the immune response by regulating the differentiation of T helper cell subpopulations. These products are potential to be the immunomodulators for treatment of various diseases including infectious diseases, cancers, autoimmune diseases and also arthritis. The objective of this study is to investigate the possible effects of the BIM A Product on the regulation of T helper cell subpopulations. The levels of various cytokines of blood collected from healthy donors before and after taking Operation BIM product (Arthrinox capsule) for 15 days were compared. Blood (5 ml. using heparin as anticoagulant) were collected from each subject at day 0. 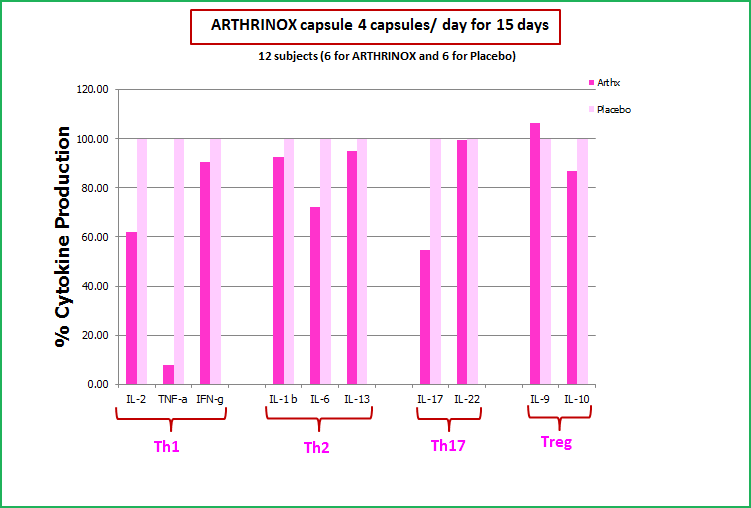 According to their groups, subjects took Arthrinox capsule or placebo (4 capsules/day) every day for 15 days. Afterward, blood was collected (5 ml. using heparin as anticoagulant) for the second time at day 16. The stimulation indexes of various cytokines in subjects taking the Arthrinox capsules and placebo were calculated and compared. 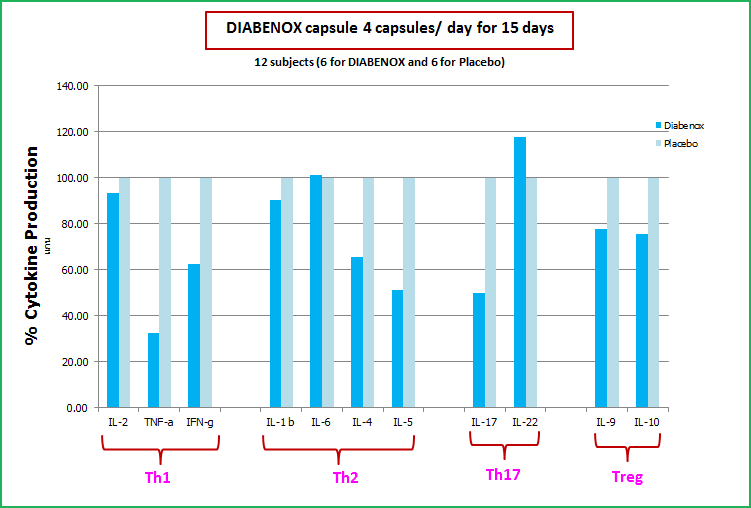 By normalization using subjects taking placebo, % enhancement and reduction of subjects taking Arthrinox capsule were shown in Figure below. The results indicate that Arthrinox capsule reduced the production of IL-2 and IL-17 and significantly reduced the production of TNF-a. Xanthones are natural substances found in the Genus Garcinia, particularly in mangosteen. 1. Growth inhibition and may have the ability to kill antibiotic-resistant gram-positive bacteria, the effectiveness equals that of vancomycin. 3. Analgesic (pain relieving) and anti-allergy. 4. Anti-oxidant – preventing heart diseases from LDL cholesterol oxidation. 5. Might be able to Kill breast cancer cells, leukemia cells, liver cancer cells, kidney cancer cells, stomach/intestinal cancer cells, and lung cancer cells (based on laboratory testing). 6. Show signs to Kill tuberculosis bacterium (based on laboratory testing). 7. May be able to Inhibit the propagation of HIV (based on laboratory testing). 8. Potential to Increase the phagocytosis, the cellular process of eliminating foreign matters and bacteria. GM-1 is found, by scientists at TMRDC, to be the most active amongst 41 xanthones in mangosteen. 2. J. Sci. Soc. Thailand, 12(1986) 239-242. 3. Free Radic Res. 2000 Nov;33(5):643-59. 5. Free Radic Res. 1995 Aug;23(2):175-84. 6. J Pharmacol Sci. 2004 May;95(1):33-40. 7. J Med Assoc Thai. 1997 Sep;80 Suppl 1:S149-54. 8. Chem Pharm Bull(Tokyo) 2003 Jul; 51(7):857-9. 10. M.Sc. in Organic Chemistry Thesis, Prince of Songkla University 1985. Topic: Th17 cytokines and vaccine-induced immunity. Topic: What is Interleukin 5? Topic: Increased serum levels of interleukin-18, -23 and -17 in Chinese patients with Alzheimer’s disease. Topic: Study of interleukin-6 production in Alzheimer’s disease. Topic: Nanoformulated alpha-mangostin ameliorates Alzheimer’s disease neuropathology by elevating LDLR expression and accelerating amyloid-beta clearance. Topic: Natural Xanthones from Garcinia mangostana with Multifunctional Activities for the Therapy of Alzheimer’s Disease. Topic: Heavy metal overload has been linked to serious problems like liver disease and brain disorders like Alzheimer’s disease.